When DistractedElf decided to transition, she worried that it could be the end of her stream. It was a big change, and she figured a lot of her audience would be pissed. But she couldn’t deny who she was. “I can’t pretend I’m not trans,” she said. DistractedElf first started streaming on Twitch after she returned from teaching English in China. When she returned to Canada, where she’s from, she didn’t really know what to do with herself. She decided to post a video a day to YouTube—then she heard about Twitch. 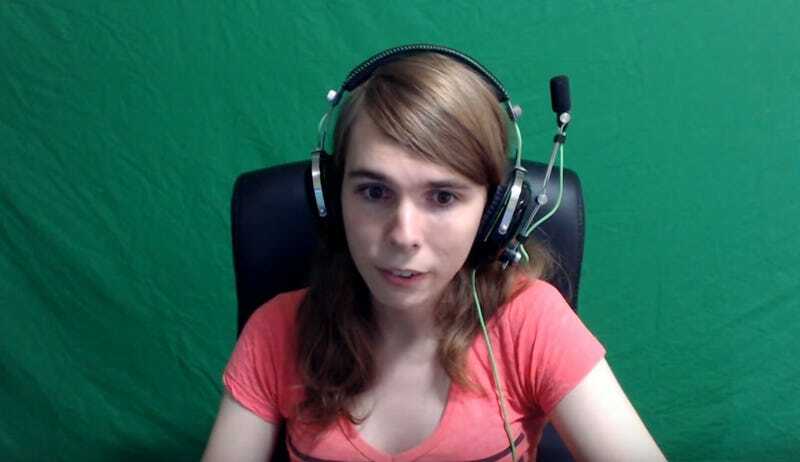 At the time, DistractedElf was, in her words, “a straight white guy streamer” just playing League of Legends with friends. By the end of her first year, she only had around 1,000 followers. Eventually, though, she struck gold in the form of EA’s now-defunct MOBA Dawngate. She started streaming the game almost exclusively and became one of EA’s streaming partners. Soon, she was regularly pulling hundreds of viewers per stream while also receiving insider info and goodies from EA. But Dawngate was fighting an impossible battle. It struggled to find anything more than a dedicated niche against the likes of League of Legends and DOTA 2. The axe was looming, but the uncertainty gave DistractedElf a chance to reflect. She didn’t feel right with herself, and it was killing her. She began to think she might be trans. One day while streaming, she put the pieces together. At first, she worried about the potential career ramifications of transitioning. She’d attracted a sizable audience, but she knew they were mostly straight dudes, so she played things like wearing women’s clothes as a joke. “I was like, ‘This is going to influence the stream, which will be problematic for my career.’” After some deliberation, though, she realized she didn’t really have a choice. She couldn’t just not be herself. DistractedElf began transitioning toward the end of her Dawngate days. The game’s development team was very supportive, as were her most vocal viewers. But after she made it public that she was trans, subscriber numbers dropped. She expected anger and incredulity, but instead, many viewers just left without a peep. Those early days were painful. Twitch chat started asking a lot of questions DistractedElf wasn’t fully prepared to answer. Her stream got raided by 4chan. They wanted to make her cry. Meanwhile, DistractedElf went through what she called an “awkward puberty.” She didn’t have a map or a sagely advice-giver on call. She had to go it mostly alone. It wasn’t all bad, though. She began to see a change in her community. Core members became sensitive to what DistractedElf was going through. The vibe of chat changed. Unfortunately, not everybody was on board with that. DistractedElf and her old best friend don’t talk anymore. It’s a sad situation, but she’s accepted it. Overall, she’s in a much better place than she was before, and she’s trying to give back. Her community had her back even when things were at their darkest, and she wants to create an environment like that for other people who are where she was when started out: confused and lonely, faced with hundreds of forking paths. While it was difficult for DistractedElf when she began her transition, she’s happy she streamed through it all. She has a record of the whole process, something she can show people who don’t understand, or who might need guidance. Still, she hopes that, if nothing else, she can help inform people who might not otherwise have a clue about what it’s like to be trans. She said on bad days, she’s gotten the same basic or offensive questions 20 times in less than 24 hours. Most of the time, her moderators and community zap the worst offenders, but she tries to be patient, because she knows that not everybody has the bandwidth to sit down and repeatedly explain things to people who can come off as willfully ignorant. DistratedElf recognizes that she’s fortunate to be able to do that, but she still maintains a single, cardinal rule in her streams: don’t be a jerk.